Whether you are a CEO, CFO, board member, or an IT executive, this book lays out a practical, how-to approach to identifying business strategies and creating value-driven technology roadmaps in your organization. From all that I have observed throughout the years, whether as President and CEO of companies or as an industry observer, I know you can only ignore the suggestions of Pham’s book … at your own peril. And it’s a heck of a lot less money than getting this same advice from an expensive team of traditional consultants; it’s faster and easy to implement the ideas in this book; and it will help your company to work more collaboratively and become more innovative. 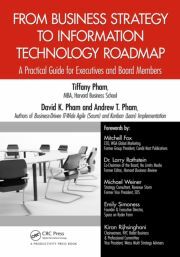 As Co-Chairman of the Board of No Limits Media … and as a former Editor of the Harvard Business Review, I had the great pleasure of reading Tiffany Pham’s book From Business Strategy to Information Technology Roadmap. The book makes a powerful case for the importance of any organization, profit-driven or nonprofit, to deeply connect its strategic thinking with its IT architecture and structure. Pham and her co-authors eloquently lay out their argument in a clear, step-by- step approach that guides the reader through the basics. I have very much enjoyed reading this new book and found it very realistic with a very logical and practical approach for how to create the necessary alignment between the business and IT organization. In our competitive world where IT can either be a strategic business enabler for competitive agility and advantage or a hindrance to the same, this book provides an easy to understand, yet profound, approach senior management can readily use. I recommend it to all senior management staff, both business and IT, and believe it should be considered as required reading in MBA programs. What’s remarkable about Pham’s book is that it offers a detailed and systematic approach that feels completely intuitive. As such, one can learn from the very practical advice here, while preserving those all-important, if nebulous, instincts. From Business Strategy to Information Technology Roadmap feels especially useful because it understands deeply something paramount to artistry: collaboration. … In this book, Pham gets to the heart of both business strategy and IT, such that those with a strategy background can better understand the IT perspective and vice versa. She also provides an efficient, yet comprehensive, primer for the young entrepreneur trying to get a handle on what strategy looks like and how it interfaces with every part of the business. Reading this book at the genesis of my organization would have saved me a lot of time and headaches. My volunteer work, coupled with my full-time job on Wall Street, has shown me how organizational goals are helped or hindered by the quality of IT. With From Business Strategy to Information Technology Roadmap, I learned that Pham demonstrates the same interest in these two perspectives—from inside both the commercial enterprise and the nonprofit organization. In this very timely book, Pham and her co-authors lay out a concise, logical, and clear pathway that both business executives and IT leaders can use to intelligently derive an IT roadmap from the organization’s business strategy as well as integrate IT into the fabric of the organization, providing innovative, creative solutions to enhance business operations. Faced with much uncertainty and economic challenges, businesses today need to be flexible and able to adapt to changing strategies and federal regulations. IT system design is a reason I hear all too often regarding why we can’t implement a new creative idea, whether it’s due to cost or archaic systems. Looking into the future, this cannot be the excuse anymore; companies need to consider IT design as a top priority and interlace it with their business strategy. This book gives a simple, systematic approach to technology design and business strategy—a must read to understand how to compete in the ever-changing global landscape. It emphasizes the need for business and tech minds to come together to develop optimal solutions, challenging the historic IT stereotype of acting like a silo and resisting large change. From Business Strategy to Information Technology Roadmap presents a simplified approach to moving your enterprise toward success and developing a long-term sustainable strategy and IT foundation. What I like about Pham’s book is that it is easy to read with real examples of business case and business strategy. Likewise, I also like the overall organization of the book, which is very logical and easy to follow. I personally recommend this book to any IT executives who would like—or need—to build an IT or technology roadmap that can more clearly support his or her company’s or nonprofit association’s business strategy. Whether you are a CEO, CFO, board member, or an IT executive, From Business Strategy to Information Technology Roadmap: A Practical Guide for Executives and Board Members lays out a practical, how-to approach to identifying business strategies and creating value-driven technology roadmaps in your organization. Unlike many other books on the subject, you will not find theories or grandiose ideas here. This book uses numerous examples, illustrations, and case studies to show you how to solve the real-world problems that business executives and technology leaders face on a day-to-day basis. Filled with actionable advice you can use immediately, the authors introduce Agile and the Lean mindset in a manner that the people in your business and technology departments can easily understand. Ideal for executives in both the commercial and nonprofit sectors, it includes two case studies: one about a commercial family business that thrived to become a multi-million-dollar company and the other about a nonprofit association based in New York City that fights against child illiteracy.